If you are reading about a new Nissan Murano available at Vann York Nissan near Winston-Salem, NC, it's because you're interested in discovering an SUV that offers predictive forward collision warning, zero gravity seats with side bolsters, and Nissan's Around View monitoring system. With seats that help reduce fatigue and a rear camera that allows you to see so much more than just what's behind you, it's easy to understand why this SUV the vehicle that offers comfort, style, and convenience. This new Murano will also keep you connected via the available rear USB connection port with smartphone interface. You can bring your entertainment with you and create the soundtrack to your next adventure in a new Nissan Murano today! 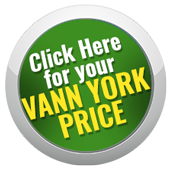 To take a new Nissan Murano for a spin near Greensboro, NC, contact Vann York Nissan near Winston-Salem, NC. Our helpful sales team will give you a tour of your next new Nissan in a pleasant buying environment. If you're looking for power-tilt and power-telescoping steering column then you're going to need to upgrade to the Nissan Murano Midnight Edition. When it's time for you to get into your next new Nissan, our Nissan dealership will help you secure any financing you might need. The exterior of the new Nissan Murano available from Vann York Nissan near Winston-Salem, NC, is just as technically advanced as the interior. A noteworthy feature available on some models is the sweeping, uninterrupted moonroof that spans both rows of seats. Now everybody can enjoy the sunshine. Of course, if you're looking for natural daylight, the LED headlamps create a light display that replicates exactly that. The lighter, lower profile is designed to set the Murano apart from the lumbering shape of a traditional SUV. When you're looking for an SUV that delivers the style, safety, and convenience you're looking for in an SUV, but in a vehicle on the vanguard of design and innovation then you are looking for a new 2017 Nissan Murano. Remember, Nissan cares about your safety as much as you do. Which is why the new Murano comes with the Nissan Advanced Air Bag System that offers dual-stage supplemental front air bags. Test drive a new Nissan Murano at Vann York Nissan near Winston-Salem, NC. Once you take home a new Nissan Murano, our Nissan dealership will be here when you need to schedule service. Visit us today for an affordable price on your next new Nissan Murano!